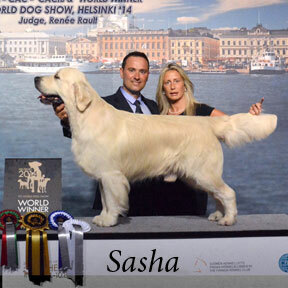 Sasha comes to us as an AI (artificial insemination) sire from Thevenet Golden Retrievers and Santiago Gadea Castro of Spain. We are both humbled and fortunate for the opportunity to expand our breeding potential to include this very special stud. Thank you to Santi and Olga for giving us this privilege to work with Thevenet Goldens and Sasha. Click to view Sasha's Pedigree and Health Clearances. All photos and videos used with permission and ©Thevenet Golden Retrievers. To learn more about Sasha, please visit his personal page.